What's Your Favorite Fictional Rant Against God? This is my first article with a question at its core, so I strongly encourage a lively debate. But! Twist! Take the following philosophy into account, and let it influence your answer. Cool? Cool. I'm not including stories, shows, or films where God/god is a speaking, interactive character. I'm talking about stories, shows, or films where if there is a god at all, his/her/its influence is invisible, or impossible to prove or quantify. Seriously: if a fictional character directly and specifically addresses their supreme being, an invisible, omnipotent, all-pervading force— they are speaking to their creator. In this case, the writer who put them there, set the scene, and put the words in their mouth. Does that thought take away from the quality of the scene? Does it influence how you look at the narrative, or enjoy it? What's your favorite? 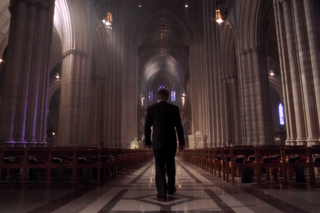 The shot at the top is from The West Wing's season two finale', Two Cathedrals. It's considered one of the best, with the President of the United States giving the Almighty one hell of a chewing out. In His own house. In Latin. It's phenomenal. So sound off! Share your thoughts! Casey Jones is a screenwriter and author with a day job. He only plays god with fictional characters; it goes well about as often as you'd think. You can ask him questions, or follow him on Twitter.